Marks and Spencer and me! Oooo – I’m on sale in M&S! Well, not me exactly, but one of my photos. 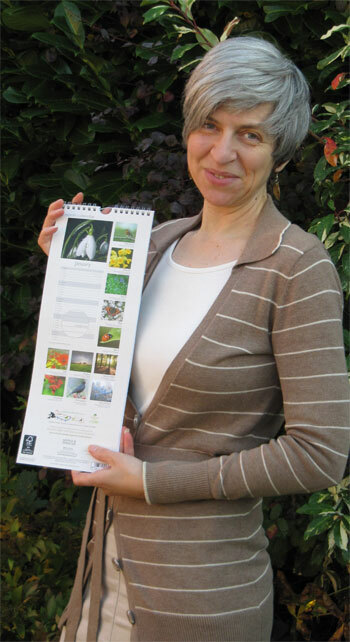 In a 2012 calendar that M&S has designed to raise funds for the Woodland Trust. Mine is the January image – a snowdrop that I photographed one cold winter’s morning, still covered in dew. Beady-eyed readers may remember that this image was in the calendar I created myself some years back to raise funds for the Yorkshire Wildlife Trust. This year, my photos are again being used in my popular BigBuzz Christmas cards, which are being sold to raise funds for the Mwabi Institute, founded by York nurse Wishart Malinga in his home village in Malawi. These deluxe cards are designed by me and printed here in York by eco-friendly waterless process on FSC certified card. They depict some of the most beautiful doors in historic York, decked out in their Yuletide splendour. Can you work out which door is in which street? The cards are on sale in packs of 5 from various outlets in York as well as on my website, where they cost £3 per pack, or 2 packs for £5. Previous After-dinner entertainment is Buzzing! Next The World’s Longest Apple Poem?